From 'Illustrations for thirteen poems from CP Cavafy'. N 12. Etching in black and aquatint. Signed in pencil and numbered XIV/XXV printed on handmade Vellum Wove 72 lb Royal. Printed by Maurice Payne and Danyon Black. Published by Editions Alecto 1967. 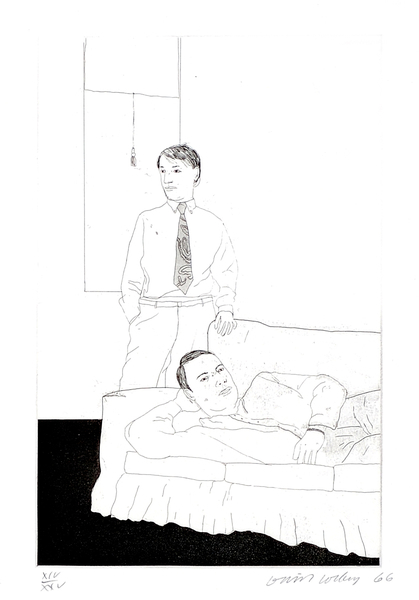 David Hockney Prints SAC N 58. David Hockney Prints Tokyo N 58. Photographs of framed print avalaible.